Dropsy was a game I’d had on my radar ever since I first heard about it around a month ago. Part of that is because traditional adventure games have become a lot less high profile (and common) than they used to be, and good ones (that aren’t horror themed) are even rarer; while visual novels and the odd cinematic games companies like Quantic Dream and TellTale manufacture are fine, sometimes you want a more traditional adventure experience. The bigger reason, though, was because the game looked absolutely insane. An adventure game about a smushy clown named after the slang term for edema (who looks like he has edema, come to that) where the objective is to hug everyone you meet? That sounds amazing, is my point here, and from the moment I saw the trailer I couldn’t wait for what I was hoping would be an awesome, humor filled, crazy adventure game that called back to games of the past… without being as maddening in its logic. Well, while Dropsy does have some minor logical issues, make no mistake: this is one of the best traditional adventure games to come out in a long time, and not only is it an excellent experience, it’s also an absolutely lovable experience to boot. The plot of Dropsy is one of those plots that starts off fairly simple and becomes really complex and weird by the end, so summing it up is no mean feat. 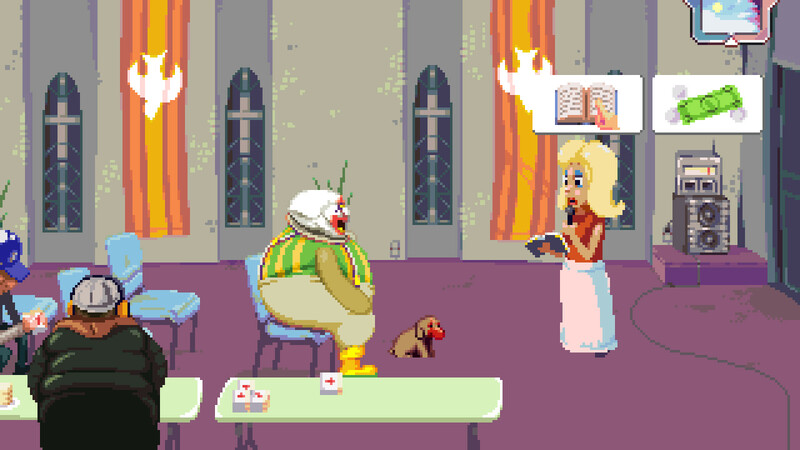 Dropsy is a clown who worked for a circus with his mom and dad before a fire destroyed the circus, and Dropsy’s life (such as it was) as the media blames him for it for… some reason. As the game begins, Dropsy’s only goal is to give his mom a gift, as it’s her birthday, though as you play, completing tasks earns you new tasks that develop the plot as you go. Dropsy’s real goal, of course, is to hug literally everyone, because at the end of the day, Dropsy just wants everyone to like him, which is… honestly a far more important part of the story than you’d think. Honestly, the plot here is really interesting, partly because it’s conveyed not through speech, but through icons, and any text that does show up in the game is displayed in a gibberish language. As such, whenever people talk, they’re not dumping loads of information on you, but speaking in pictograms that you infer meaning from, so you’re not listening to extensive exposition dumps; instead, people talk through simple pictures, and you infer the more complicated meanings onto those pictures. This, oddly enough, makes the plot more endearing (and also makes up many of the puzzles in the game), as you’re left to infer your own meaning on the events rather than the game forcing it upon you, which makes the plot resonate with the player more easily. 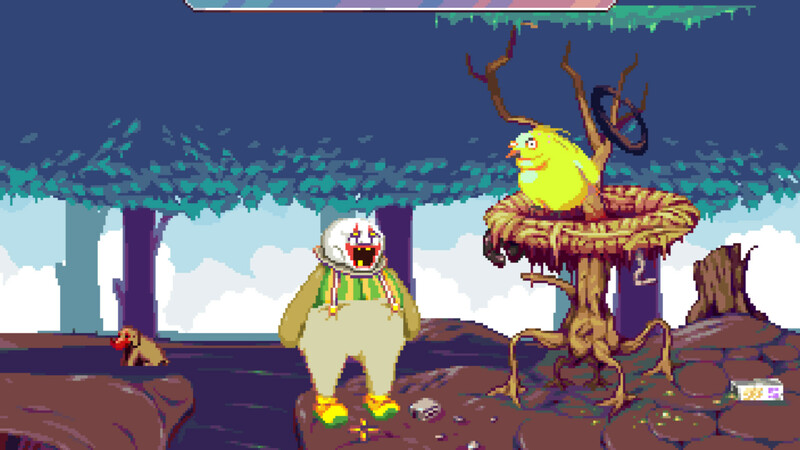 The plot also really works because Dropsy, for his weird appearance, is honestly a really likable protagonist. He’s a simple person (in both senses of the word) who only wants people to like him, and he helps people readily while only wanting their acceptance and hugs in return, so it’s really hard not to appreciate him for his simple, lovable charm. It’s kind of amazing that such a simple plot could make you actively appreciate a character who looks as odd as he does, but not only does the game pull this off, it does so effortlessly, and everyone I’ve showed the game to has agreed so far. 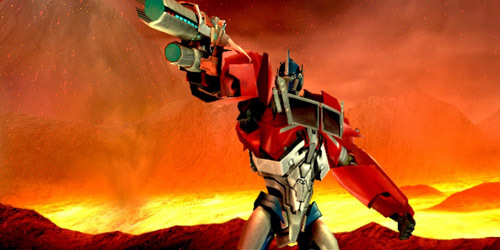 The visual style of the game does a lot to make it as interesting as it is, as the game uses an engine that wouldn’t seem out of place in the SVGA days of adventure gaming. The sprites, though well animated (though walking animations aren’t great), are decidedly retro in their appearance, as are the environments, though everything is clean and easily discernable, so you won’t be pixel-hunting because of low-res textures. The game transcends this retro style, though, by way of an art direction that seems like it takes inspiration from a bad LSD trip or a fever dream, and it’s amazing. A fairly simple city lets out to a road that leads to a burned out airport or, in the other direction, a desert, while ethereal caves lead to ancient alien ruins or haunted forests, and dreamscapes can be as cheerful or as horrifying as you can imagine. The art style is completely, purposefully insane, in other words, and you’ll definitely remember it long after you’ve played the game. Aurally, the game has an interesting soundtrack to it that features a wide variety of musical styles (mostly in cassette tapes you find while playing), and all of the music is interesting and well composed. The game doesn’t do anything with voice acting per say, instead having the characters all speak in an odd sort of grumble language while pictograms appear over their head, and Dropsy is the only character who has really unique verbalizations, which helps add to the charm of the game. 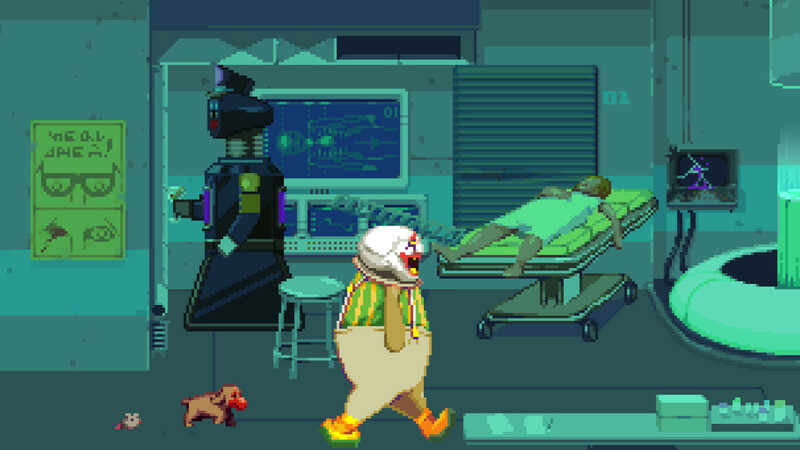 The game also has a strong effect presentation, as the various normal sound effects work really well, and little touches, like an option to turn on a clown shoe squeak as Dropsy walks, or a button on the save screen that farts for no reason, add a lot of charm to the game. Dropsy is your standard point-and-click adventure game, albeit one that’s simplified in comparison to the games of the 80’s and early 90’s. The mouse cursor controls every action you take; clicking it on the environment causes Dropsy to try to move to that location, while clicking on an interactive person or object will cause Dropsy to try to interact with it in some way, be it talking (for people) or using (for objects). Dropsy himself only has two other options outside of this when attempting to interact with the world: his inventory (inside his pants), which allows you to select an object to try to use as needed, and the “hug” option, which allows you to hug the person or thing you’re clicking on. As mentioned above, the game uses a fairly traditional adventure game system, in that you’ll have to solve puzzles in order to progress through the plot. Generally, the flow of any puzzle in the game works more or less the same: figure out what their pictograms mean, find the action or object that resolves their issue, and provide it to them in exchange for hugs. Sometimes this is very easy (such as with the quasi-tutorial puzzle in the beginning where a bird wants food), while other times this can be quite the conundrum (figuring out how to get a tire back for your dad), depending on both what the characters want and what things you’ll need to resolve their issue. The game is based entirely around “find object, use object” puzzles, though, so you won’t find any crazy Soup Cans style puzzles here, and while most of the puzzles are surprisingly sensible, if you do get stuck, you can easily experiment until you figure things out at least. The game does have a few other novelties to it beyond simple plot-based puzzle solving, though, so you’ll find that you’ve got plenty of things to have fun with. The game offers you up a few mandatory puzzles to solve in order to progress the plot, but you’ll also see a whole lot of people around town who have something that’s bumming them out who aren’t integral to the plot. 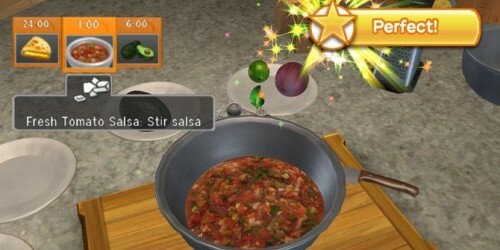 These puzzles are often just as complex as the story-based puzzles, meaning that some are as simple as finding an object and giving it to a person, while others might require you to use an item to distract an NPC, to get another item to resolve one person’s needs before you can resolve the first person’s needs. 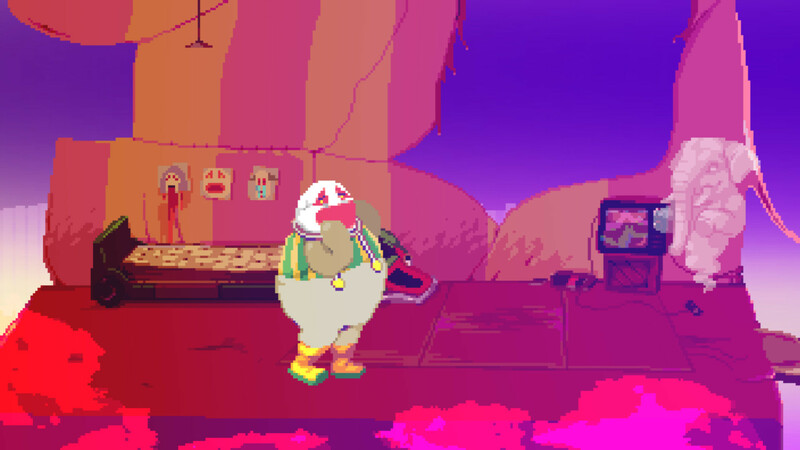 It also helps that Dropsy isn’t alone in his quest to hug everyone he meets, as he starts off with his pet dog, and can meet other animal friends who are all too willing to help him out, usually because he’s nice to them. Each pet has their own unique talents that can help you solve puzzles, and each time you get a new friend you’ll want to head back and experiment with things you couldn’t access before to see if your friend can help you out with resolving the puzzle in question. Also, Dropsy’s dog can pee on various things in the game world, and that’s never not funny when it happens, especially when the dog can pee on things Dropsy can hug. Dropsy can be completed in around three to six hours, depending on how many of the townsfolk you try to help out and how good you are at resolving the puzzles, but there’s plenty of reason to come back to the game after the first time you’ve completed it. The game has a lot of puzzles that require a bit of investigating, and it’s entirely possible you’ll miss everything you can possibly see and do the first (or even second) time around, so it’s worth it to come back and experiment just to see what you might have missed. It’s also notable that the developer is working on adding in more content beyond what’s already in the game, so you can rest assured that there will be stuff to come back to once that’s released. There’s also an Achievement list set up for the game on Steam, for those who’d like to be able to unlock these things, and if nothing else, it’ll be fun to try and figure out where all the collectibles (of which there aren’t a whole lot, thankfully) and huggable people might be located. Beyond that, the game just has such a large amount of joyful personality, honestly, that after three playthroughs I’m still not even close to tired of it, and that says a lot for the game’s charm and personality. It’s just such a joyful experience that you’ll want to keep coming back to it, just to see what you’ve missed or to experiment with the game world, and it’s just so well put together that it’s easy to recommend. That said, there are two notable issues with the game that keep it from being as amazing as it would be otherwise. The first is that, while the majority of the puzzles are set up well enough that they make sense and are logically solved, some of the puzzles are outright obtuse, and while the developer has acknowledged this in the Steam community and is working to assist players with the game, it’s still a bit of a black mark on an otherwise excellent game. A built-in hint system probably would’ve helped a lot, and while working together with the community and the developer aren’t bad ways to work around that, it’d have been nice to have that self-contained within the game. The other, more problematic issue is that for a game that was released in a complete state, the game simply isn’t there yet. The game launched with a couple of bugs that kept side missions from resolving properly, and even now the game’s Trophies still don’t work, which isn’t the worst thing in the world, but it does mean you’ll have to complete the game another time once those are implemented if you want them to show up. Also there’s a Trophy called “John Wayne Gassy,” which is… something? All told, though, considering the developer is seriously committed to patching and adding content to the game, there’s not a single compelling reason I can think of not to immediately recommend Dropsy to everyone, unless you hate adventure games or clowns or something. The story is simple but told in a fashion that’s both easy to understand and incredibly compelling, and the artistic style of the visuals and strong audio direction make this a game that’s heavy on style you’ll remember for a long time to come. The gameplay features the same sort of simplified mechanics that old-school adventure games have used for decades, but in a way that’s more accessible than many from the past, and there’s enough charm and novelty to the game to make it worth returning to on its own, to say nothing of the additional replay value on tap. Some of the puzzles require a lot of outside the box thinking, and the game still needs some patching before it’ll be complete, but the developer seems totally committed to doing this thing, so I have faith it’ll get done at least. If you can forgive a couple technical hiccups and you’re not terrified of clowns, Dropsy is a charming and engaging adventure game that’s extremely easy to recommend. You’ll definitely remember and enjoy your time with it, and it’s a steal at its asking price, unless you’re some kind of adventure game hating heathen or something. Dropsy is one of the more surprising games released this year, as its inexpensive price point and classic adventure game trappings are built around a game that’s an endearing and memorable experience that almost anyone can (and should) enjoy. The simplistic but uniquely expressed plot combined with the truly surreal visual style and strong aural presentation make for a game that’s affecting from the moment you boot it up. The simple mechanics give the experience an accessibility that makes it easy to appreciate and work with, and between some fairly intuitive puzzles and a good amount of stuff to do, the game more than justifies its asking price and then some. Some of the puzzles are a bit too obtuse, of course, and the game needs a bit more patching before it’ll be in top shape, but if you’re willing to overlook that and work around it, it’ll be worth it. Dropsy is, simply put, unlike anything you’ve played before, and it’s a charming and dynamic game that’ll honestly win over anyone who isn’t anti-clown or anti-adventure game.